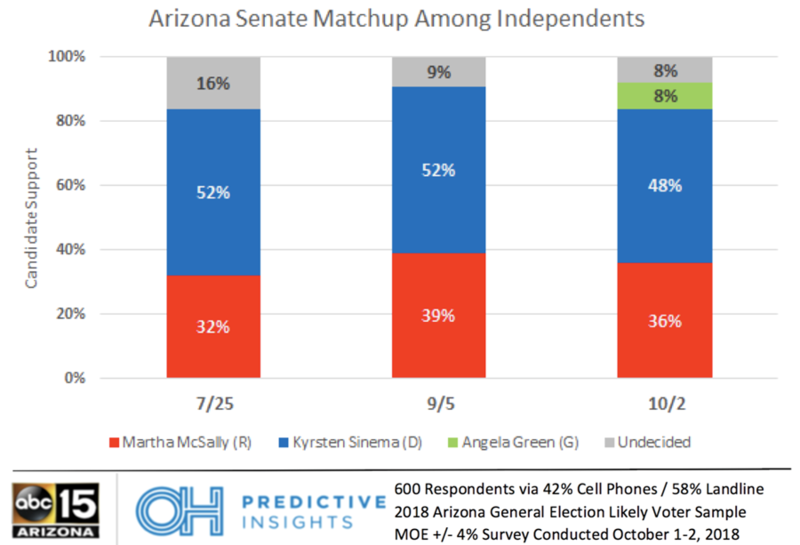 PHOENIX (Oct 10, 2018) – The latest poll from OH Predictive Insights and ABC15 Arizona (ABC15/OHPI) shows that Martha McSally, Arizona's Republican nominee for U.S. Senate, has increased her lead over Democratic nominee Kyrsten Sinema, since our last poll. 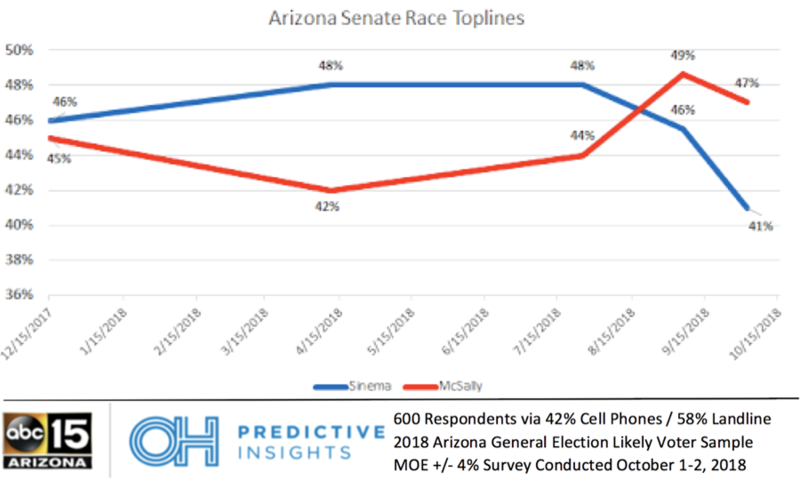 Although the amount of undecided voters has grown to 8%, McSally is currently leading with 47% of the vote and Sinema has dropped down to 41%. The introduction of Green Party candidate Angela Green takes from Sinema’s share, with 4% of the vote. The biggest trend continues to be among key swing groups, including voters with a Bachelor’s degree and women. Although our last OHPI poll showed that McSally’s lead was directly linked to Trump approval, it appears that is changing among the same groups as Trump’s numbers continue to rise. While Trump approval has improved with these swing groups, McSally’s lead has not followed at the same pace. 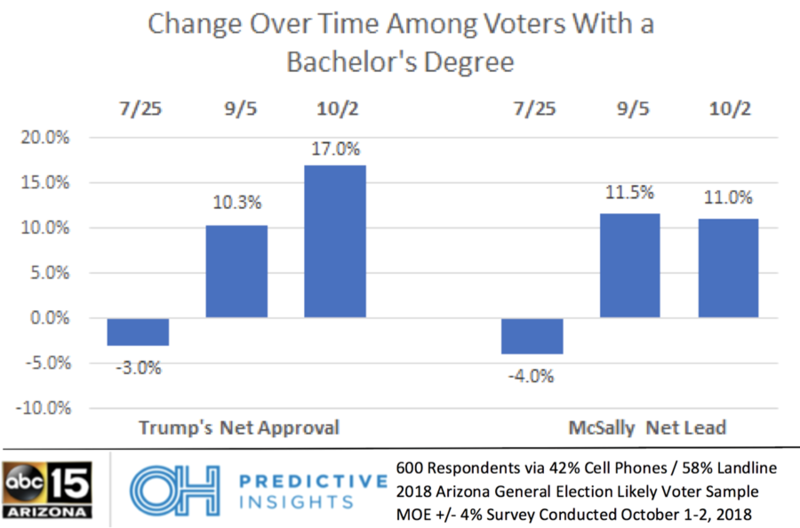 Among those with a Bachelor’s degree, Trump approval rose by 7 points while McSally’s lead over Sinema did not increase, unlike the difference between the July and September polls. 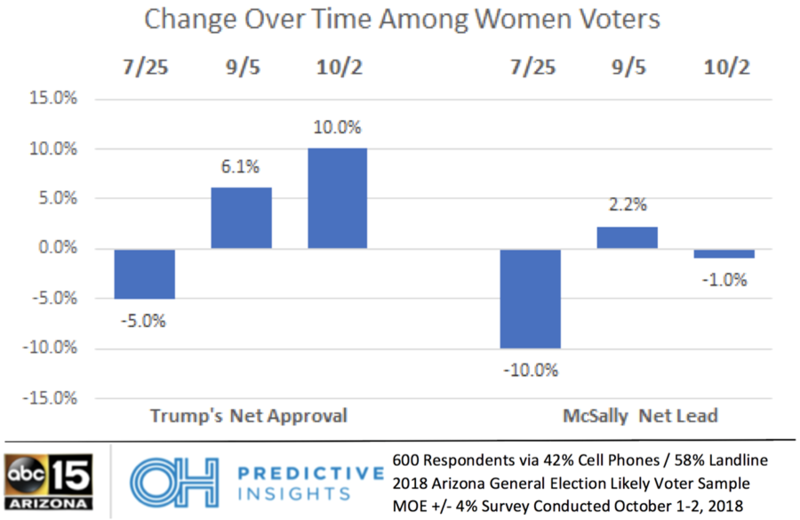 The same pattern appears among women: our last poll showed both Trump and McSally’s numbers spike with female voters, but now Trump is up and McSally is down. Trump’s net approval grew to 10%, while McSally fell to -1%. Among Independent voters, Sinema is leading over McSally, with 48% of the vote. McSally currently sits with 36% of the vote and Greene with 8%. Sinema’s lead with this group has been consistent since July. Methodology: This 42% live caller and 58% automated phone poll was completed by OH Predictive Insights on October 1, 2018 and October 2, 2018, from a likely 2018 General Election voter sample. The sample demographics accurately reflected party affiliation, gender, region, and age. The sample size was 600 completed surveys, with a MoE of ± 4%. Numbers may not total 100%, due to rounding. Poll report for the General Election poll can be viewed here. It is important to note that ABC15/OHPI have been tracking this race since Dec. ‘17 and we have not adjusted from our beginning makeup of the electorate in order to accurately show the changes in the race. We plan on adjusting the sample makeup to reflect incoming early mail ballots as we get closer to election day and are able to look to derive the best estimate of the unique 2018 Arizona voting population. Phoenix-based OH Predictive Insights provides accurate polling, focus groups, data analytics and advanced targeted marketing to political and non-political clients alike. With leading professionals in the advertising, communication, polling and political arenas, OH Predictive Insights will service political and non-political clients looking to improve their footing on key stakeholders and consumers. For more information, please call 602-254-5159 or submit a request online. The Arizona Capitol Times, an award-winning and nonpartisan publication, is the leading source of political and state government news in Arizona. Arizona News Service, which publishes the Arizona Capitol Times, also produces Legislation On Line Arizona, Arizona Legislative Report, Yellow Sheet Report, AzLobbyists.com, and several special publications.